Be the first to share your favorite memory, photo or story of Sandra Jo. This memorial page is dedicated for family, friends and future generations to celebrate the life of their loved one. 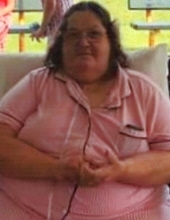 Sandra Jo (Blake) Whipkey “Bull Dog”, age 61, of Waynesburg, PA, passed away Tuesday, March 19, 2019 in her home, with her family by her side. Sandra was born February 10, 1958 in Moundsville, WV, she is the daughter of the late James E. and Mae D. (Richmond) Blake. Sandra was a Greene County resident all her life. She was a member of WWJD Christian Center in Bucktown, PA, where she was on the Dartball League for the past 12 years. Sandra married Charles R. Whipkey, Sr., who survives, on September 17, 1977 and they were happily married for 41 years. She enjoyed cross-word puzzles, coloring and jigsaw puzzles. Sandra loved to spend time with her grandchildren and family. In addition to her husband, she is survived by three children, Rachel (Charles Eddy) John, of Waynesburg, PA, Charles R. (Candace) Whipkey, Jr., of Carmichaels, PA, and Angela L. (Earl) Guesman, of Nemacolin, PA; ten grandchildren, Terry Lee Gump, Jr., Alexis Barber, Sammy F. Guesman, Dakota J. Barber, Joshua Whipkey, Christopher Whipkey, Alyssa Guesman, Haylie Whipkey, Chasity Whipkey and Harlie Whipkey; five sisters, Donna Baker, Violet (Joseph) Simms, Doris (John) Archbold, Ruby (Robert) Witherow and Peggy (Kenneth) Hughes; one brother, Freddy (Becky) Blake; several nieces and nephews. In addition to her parents, she was preceded in death by four brothers, James, Woody, George and Jack Blake; one sister, Helen Aule; two nephews, Michael Kiger and Michael Glenn Blake. Friends will be received on Friday, March 22, 2019 from 2-4 p.m. and 6-8 p.m. at Kesterson-Rush Funeral Home, LLC., 3275 W. Roy Furman Hwy., Rogersville, PA. 15359. Telephone: 724-499-5181. A funeral service will be held on Saturday, March 23, 2019 at 1:00 p.m. in the funeral home with Pastors Jim and Cathy Carpenter, co-officiating. Burial will follow at Cedar Grove Cemetery, Mt. Morris, PA.
To send flowers or a remembrance gift to the family of Sandra Jo (Blake) Whipkey, please visit our Tribute Store. "Email Address" would like to share the life celebration of Sandra Jo (Blake) Whipkey. Click on the "link" to go to share a favorite memory or leave a condolence message for the family.